Yaupon Hollies Are a Great Fit and Tasty Too! Yaupon hollies (Ilex vomitoria) are evergreen, provide great fall/winter color, and can adapt to numerous landscape situations. They are also very durable and can survive extreme drought. Yaupon hollies are dioecious, meaning male and female flowers are produced on separate plants and berries are only produced on female plants. Flowers are creamy white, but not showy on both male and female plants and berries can range in color from red to yellow depending on cultivar. The plants are favored by wildlife – pollinators are attracted to the flowers and birds love the berries. Yaupon hollies are native plants with a number of different cultivars available at plant nurseries. ‘Jewel’ is a cultivar that produces an ubundance of red berries and ‘Aureo’ produces yellow berries. 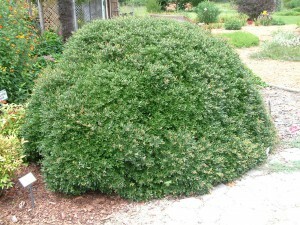 ‘Nana’, a dwarf, compact male cultivar is an excellent replacement for boxwoods. Large growing cultivars can grow to 15 to 25 feet tall and can be shaped as trees or left as large shrubs. ‘Folsom’s Weeping’ and ‘Pendula’ are two weeping cultivars that can be utilized as dramatic specimen trees. 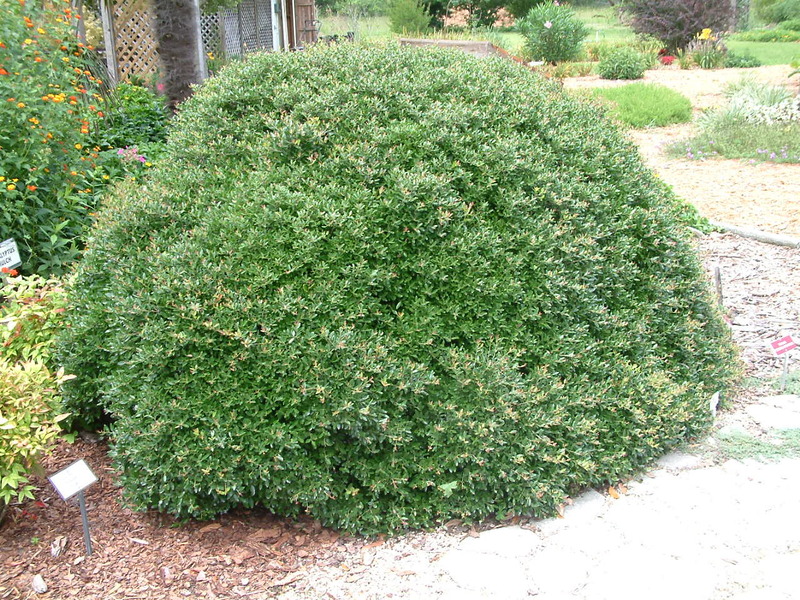 Dwarf Yaupon hollies will naturally form a mound without pruning. Yaupon holly fruit and foliage. Photo courtesy UF/IFAS. Yaupon hollies prefer to be planted in full to partial sun. It is important to note that they are drought tolerant and require a site with well-drained soil. Because only the female plants produce berries, it is best to purchase plant material when plants contain berries in late fall and winter. Yaupon hollies spread readily by vegetative sprouts. Sprouts should be pruned down to the soil line 2 – 3 times per year. They do not have many disease or insect problems, but scale, leaf miners, mites, and aphids can sometimes be a problem. 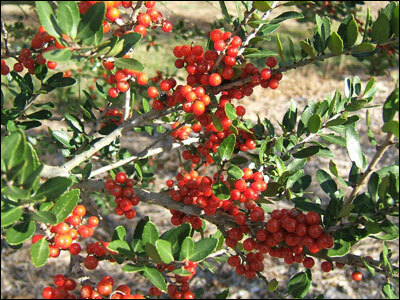 The leaves of the yaupon holly contain a higher caffeine content than any other plant native to North America. The Seminole Indians would purposely brew a concentrated “Black Drink” tea to induce vomiting and diarrhea for believed purification. Southerners utilized the caffeine in the leaves during the Civil War. If the leaves are steeped for a short period, a black tea or coffee substitute can brewed. A related species of holly (Ilex paraguariensis) from Brazil is used to make a drink called Yerba Mate, which is as popular in South America as coffee is in North America. For more information on yaupon hollies, please visit the publication located at this link https://edis.ifas.ufl.edu/st311. Native yuccas fit easily into the landscape without breaking the bank or the back of the gardener. Being sharp is usually considered a complement. It implies the recipient of this assessment has the intellectual ability and the mental acuity to handle with ease the rigors of contemporary life. 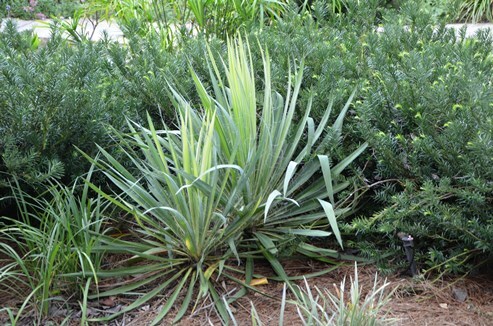 In north Florida’s native plant world the yucca genus was sharp long before people employed it in landscapes. It also has the sharp pointy spines to enforce its tactics. Local yuccas are perennial shrubs which can grow into small trees with a unique shape. There are approximately 50 species in this genus worldwide on every continent except Antarctica. Their most obvious and notable feature which makes them easy to identify is their leaves. These are elongated in thick clusters around the stems. The sword-like shape is tipped with a hardened point which can quickly get the attention of anyone passing too close. The bristly structure of these evergreen plants gives them an intimidating appearance which most animals and people avoid. The annual blooms appear at the top of these plants and protrude above the greenery. Honeybees and other pollinators will visit the profusely fragrant bell-shaped flowers to collect nectar and pollen. In their native range, these plants are seen in sites where there is high exposure to the sun. They will not grow in heavy shade, and languish with little change if there is less than six to eight hours of daily sun. 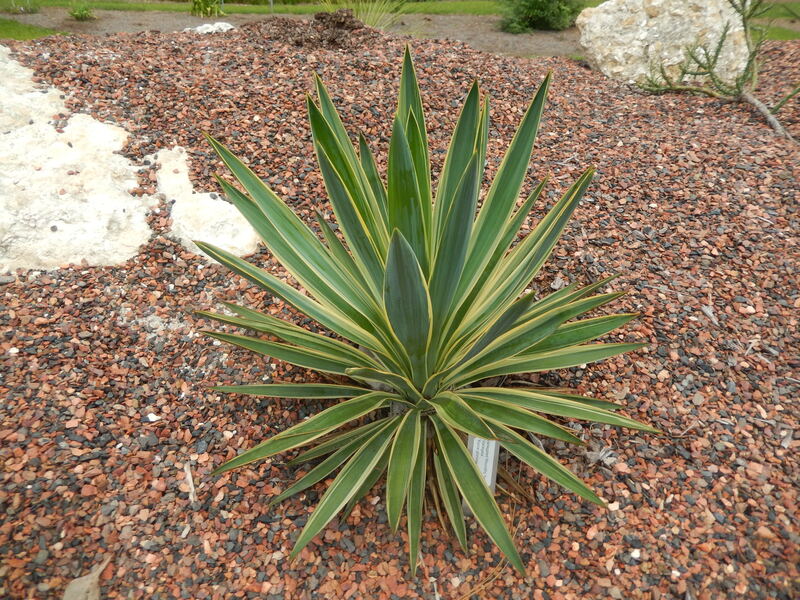 Sandy well drained soils are the most likely locations where yuccas will prosper and grow. Their nutrient requirement are low, so they rarely display symptoms of a nutrient deficiency. Likewise, their need for water is paltry. Once established they will easily withstand droughts and extended dry periods. The common species native to north Florida in this genus are Adam’s needles (Yucca filamentosa) and Spanish bayonets (Yucca aloifolia). These plants are similar in appearance, but each has distinctive traits. Adam’s needles are the smaller and shorter of the two species. The multiple stems may reach three feet in height, but extend to over six feet when the cream color blooms appear in early summer. The green leaves are pliable with white threads of fiber trailing from each. There is a variegated cultivar which is popular for landscaping projects. Spanish bayonets produce multiple trunks per plant and may grow to over 15 feet. They produce rigid dark green leaves projecting from the thick trunks and will impale any trespasser. White blossoms appear in the center of the plant above the foliage from spring to late summer depending on several weather related factors. These yuccas have a high salt tolerance making wild plantings common to coastal areas. Disease and insect problems are few for these hardy plants. Too much water resulting in excessively wet roots and extreme cold are the biggest problems. For the sharp homeowner these native plants make a pointedly good addition to the landscape. To learn more about native yuccas in north Florida, contact the nearest UF/IFAS Extension office. Summer is here, along with its heat, humidity, drought and stress! One easy way to garden during summer is to use succulents and other drought adapted plants. The sea urchin cactus (Echinopsis spp.) produces large, stunning flowers. Succulents are heat-adapted, water-efficient plants often associated with deserts and dunes. Usually succulents have thick leaves or stems that store water. A cactus is a familiar type of succulent, as are agave, aloe, yucca as well as bromeliads like dyckia. 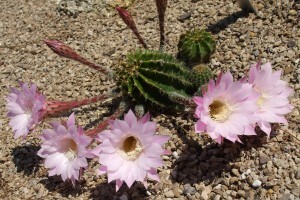 Other dry-adapted plants can retreat into bulbs, rhizomes or other thick plant parts to go dormant until rains resume. A few other strategies used by plants to save water include: waxy or hairy coverings to reduce water loss; extensive root systems to absorb water; and silver- or blue-colored leaves and stems to reflect light and reduce heat. Succulents’ tough qualities make them well-adapted to the harsh conditions of urban living amid concrete, brick, asphalt and other “hardscapes”. This adaptability translates into low maintenance since they need little or no irrigation, fertilization, pruning or spraying. Do you like container gardens? Succulents are almost the perfect container plant, because they hardly ever need watering! The American century plant (Agave americana) is a large growing succulent with silver-grey leaves. Above and beyond their toughness, succulents capture our imaginations because they are often dramatic, dangerous and slightly unpredictable. Drama stems from the architectural forms of many thick-leaved plants like agave. Danger arises from the thorns and spines of plants like cactus. Unpredictability results from bulbs and perennials that can quickly explode into flower, and then disappear just as suddenly. Often succulents have outrageous flowers with wild, bold colors and strange shapes! While many succulents are native to deserts, others are Florida natives where they can be found in coastal dunes or in areas with sandy soils that have little water-holding capacity. For example, many native yuccas are excellent succulents for use in dry gardens or in containers. For best growth and appearance, most succulents require well-drained soil and full sun (at least 6 hours of direct sunlight per day). Succulents are ideal plants for garden beds near roads, sidewalks, driveways and south-facing walls because they tolerate limited soil moisture, higher soil pH and reflected heat and light usually associated with these areas. On the other hand, try to avoid planting succulents in shady areas, wet areas, low areas that collect water and areas with heavy soils. Summer gardening is easy with succulents! Weather sayings can be quite colorful. Some of them may be connected to scientific observations, while others are more superstitious in nature. What the weather will do this month can change on a moment’s notice. March is definitely one of the more unpredictable months. One week the temperatures are warm and spring-like. A few days later the weather turns stormy and cold. Depending on the groundhog you follow, spring will be here, or not, in the next few weeks. 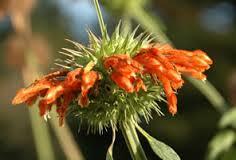 Lion’s ear and Lamb’s ear are two plants that survive under hot, dry conditions. 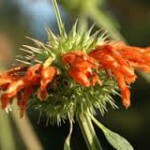 Lion’s ear, Leonotis nepetifolia, is a tall-growing (8 feet) annual with orange tubular flowers that peek out of the spiny bloom head, giving the appearance of a lion’s ear. Hummingbirds reportedly hover next to a flower or even perch on a cluster, drinking for 10 seconds or longer. 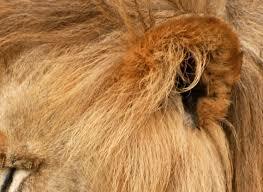 That’s an eternity in hummer world and about as long as any lion would tolerate someone messing with his ears. Lamb’s ear, Stachys byzantina, is an easy care perennial with wooly gray-green leaves and lavender colored flower spikes. It makes an attractive accent in a container or excellent groundcover that invites you to experience its soft “wool”, like those cute little ears of a baby sheep. Both of these plants are self-sustaining species that establish well in open dry areas. 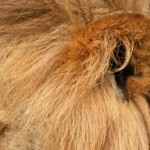 The lion’s ear must self sow seed to return each year. 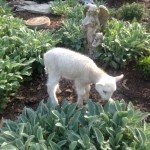 Whereas, the lamb’s ear will return from the roots and can be divided if relocation is desired. Lion or lamb, March is a good time to plan for easy care, summer, blooming flowers. While it may be “freezing” now, you know once it gets hot, the last place you will want to be is outside in the blazing sun. Maybe the thoughts will warm you. 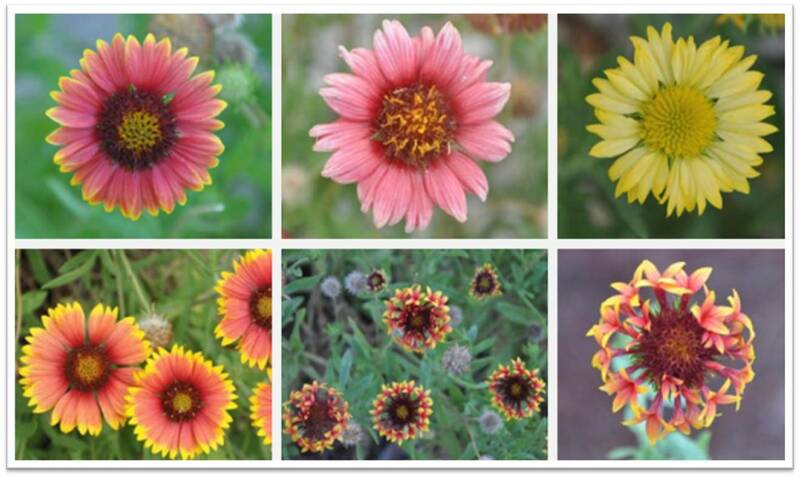 Gaillardia is a favorite one of many wildflowers throughout the United States. It is a member of the Aster family, and is most commonly known as Indian Blanket or Blanket Flower. Individual plants can reach up to 2 feet high. They are heat and drought tolerant and, in Northwest Florida, flower from summer through fall. The entrance to the Gadsden County Extension Office is flanked on either side by stands of Indian Blankets. Blooms are an array of red, orange, and yellow. While it may be rare to find a flower with the center cone and petals completely yellow or orange, they are evident in our garden. What most people find peculiar is appearance of tubular, trumpet-like, florets on the flower ray. The striking display of flower color Indian Blanket offers is not its only feature. It is also a source of nectar for many different butterfly species. Stephen Brown, a horticulture agent in Lee County Florida, has an excellent publication on Gaillardia pulchella that lists this plant species’ interesting attributes.